Apparently it’s former MySpace exec venture capital funding day. Earlier we announced the BeachMint news ($5 million). 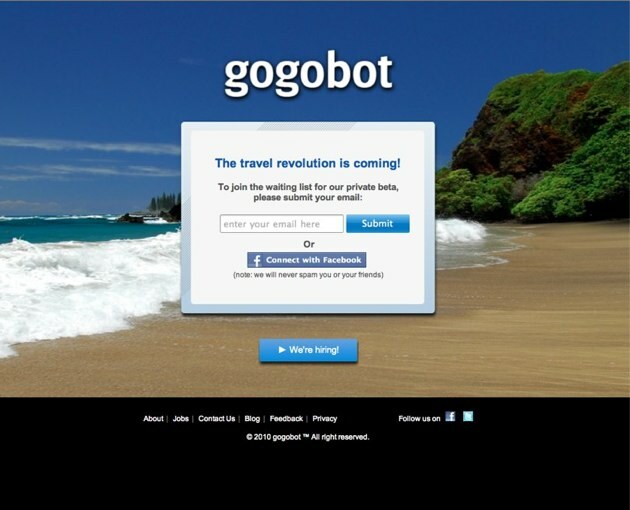 And now gogobot, a new travel website founded by MySpace’s former GM International Travis Katz and Ori Zaltzman, the former Chief Architect of Yahoo Boss, are announcing an impressive venture funding of their own. They first hinted about their startup in March. I’m in! If you know where you want to go and don’t want to extend discovery beyond price comparisons, Trip Advisor reviews and maybe a few pictures and some descriptive text then current services are fine. But let’s say you’re planning to take a month off and want to rent a house somewhere in the world but you don’t know, say, the perfect village and villa in Tuscany to stay (something I’m currently planning for August). “Will you help me figure that out?” I asked Katz. “Yes,” he says, but pointing out that the site isn’t just for long and/or expensive vacations. But for now, he won’t say exactly how it will all work. Launch is still months away, but whatever they’re planning seems to have impressed Battery Ventures. The venture firm put $4 million into gogobot and principal Satya Patel has joined the board of directors. And former MySpace founder and CEO Chris DeWolfe is an advisor to the company. Want to know more? Sign up to join the private beta when it launches on their home page. The company, which is based in Palo Alto, is also aggressively hiring – details here.